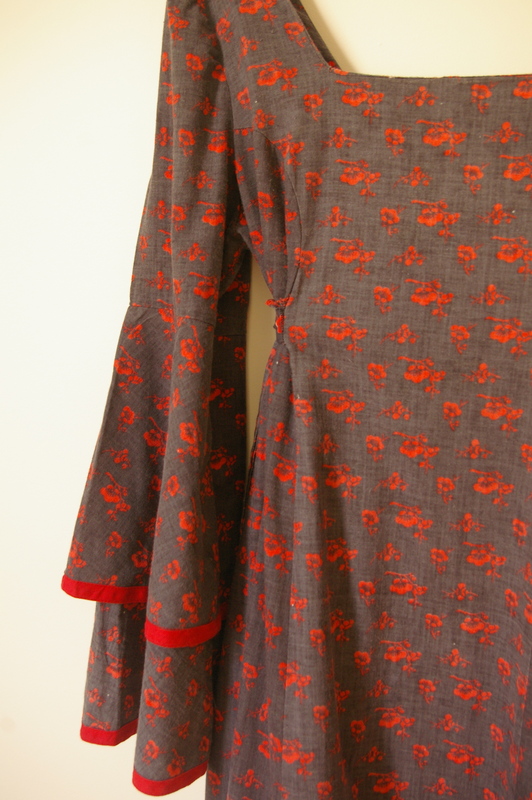 The fabric is a print of dark salmon-pink sakura blossom on an indigo background- I don’t know if it is Japanese or just made to look like it but I love the strong contrast and simplicity. 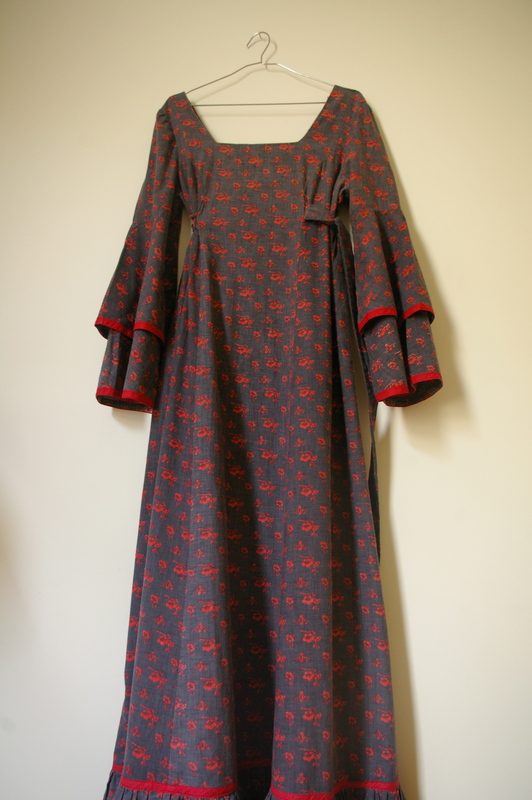 While the empire line, voluminous sleeves and double ruffled hem are similar to other of her prairie dresses that I’ve seen, it is far removed from the kind of Laura Ashley dress that I remember from childhood… no pastel country prints here. Which makes me wonder how far she had progressed from her origins by the time the 80’s hit… This talks a bit about the story, as does this. I would have loved to get married in this… but I’ve already tied the knot, plus I can’t squeeze into it anyway ; ) So my question is, how significant and collectable is a dress like this? I had thought of turning it into a sundress… but perhaps it should be kept as it is. Anybody have any idea? This entry was posted in textiles on October 11, 2011 by admin. It is amazing! don’t know, it is a shame to not wear it, but a shame to change it as well. I can’t stand how much I love the sleeves! Hmmmm…. if it’s a bit too tight to wear then keep it as a pretty thing to look at. If it’s realistically going to fit with only a few adjustments (Like taking off some length to add panels that will let out the princess seams) then I’d still keep it as close as possible to the original. 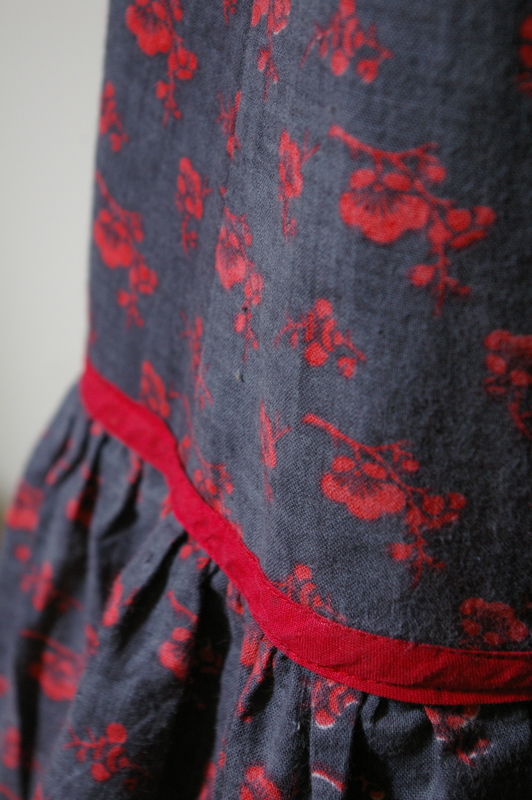 If it’s a matter of completely recutting the whole thing to make a sundress then just go for it. I lover Savers – even if it does smell weird. Put it on a beautiful wooden coathanger and hang it up somewhere so that it makes you smile every day. Oh my word, that is GORGEOUS! I think if I knew it was never going to fit me I’d have to make something else from the fabric … it would seem a pity to just look at it when I could be wearing it.